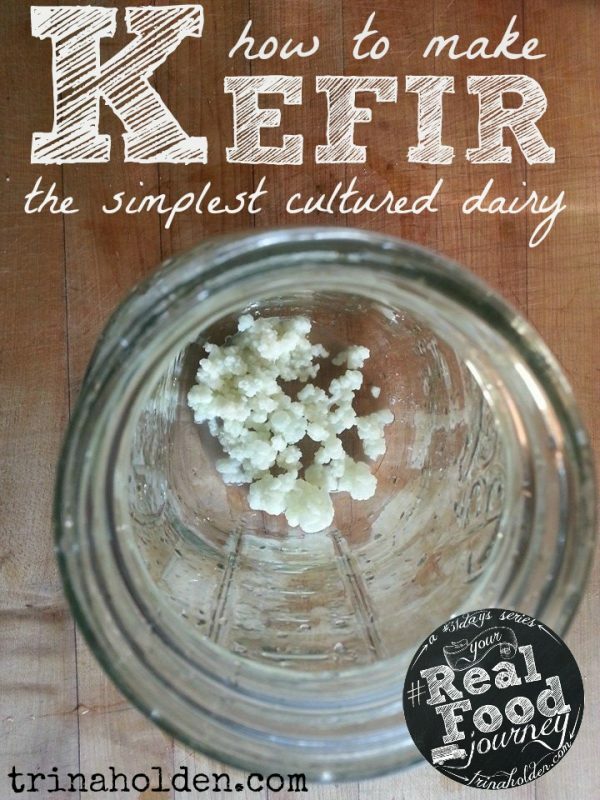 Kefir really is incredibly simple! 1. Pour milk into a jar containing kefir grains. 3. Set on counter for 2-3 days till it firms up. 4. Strain kefir through colander to harvest the grains for next batch. 5. Put finished kefir back into the jar and put in fridge. It has lots of beneficial bacteria and probiotics–although the cultures are different and thus you’re getting more variety of probiotics if you have both kefir and yogurt in your diet. It can be made with whatever milk you have access to–raw, pasteurized, or homogenized–as long as it’s from animal milk. (Dairy alternatives like coconut or almond milk need a different starter.) It’s a great way redeem pasteurized milk. 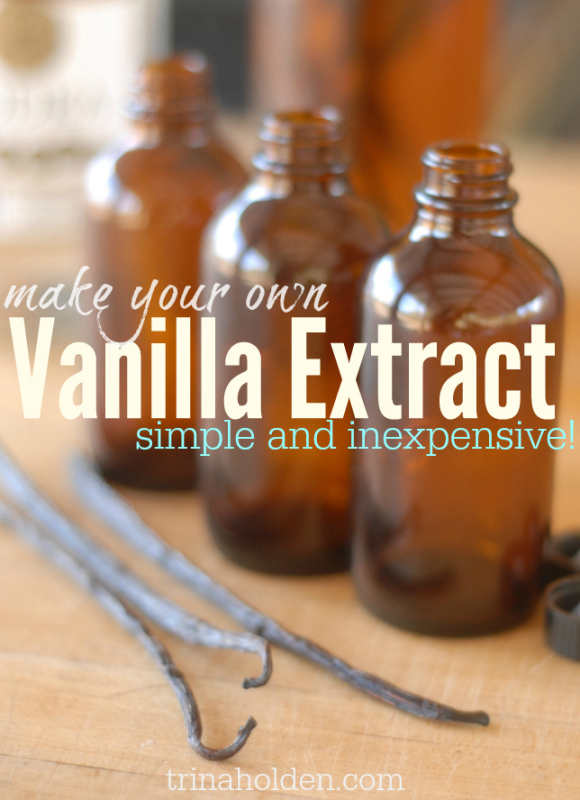 It can be used in baking, soaking your grains, smoothies, and even eaten plain. You don’t have to heat the milk before you add the culture. 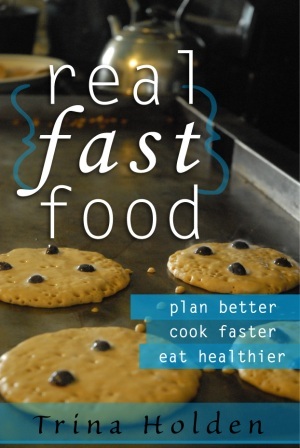 The starter is not readily available at your local grocery store, like it is for yogurt. Option #2 If you don’t have a friend or a friend of a friend to get some grains from, I suggest looking on Craig’s List, or asking around at your local farmers market, co-op, or health food store, or any place crunchy people congregate. 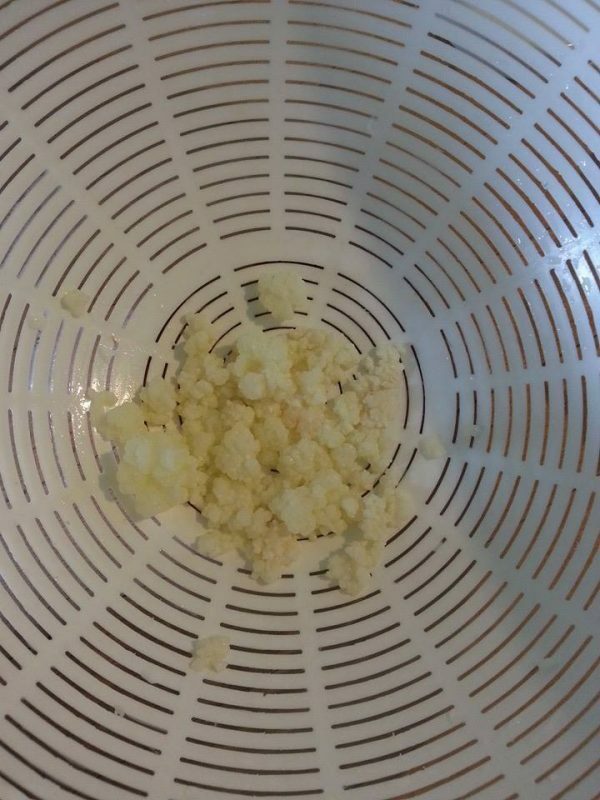 Kefir grains look like cauliflower and are similar in texture to tapioca pearls–slightly firm and gummy. Each time you make kefir, you strain the finished kefir through a colander to separate the grains so you can make another batch. Each time you use the grains, they will reproduce, allowing you to eventually split your grains and share them with others. For the first year I had my grains, they were reproducing soooo slowly, I rarely had enough to divide and share them. Then a friend pointed out that the holes in my colander might be too big…little baby grains were probably all going through the holes! I switched colanders and, sure enough, my grains started multiplying! I rinse my grains under cold water between each use to keep them fresh and clean. Then they go into a clean jar which I then fill up with fresh milk to start another batch. If at any time I don’t want to make another batch of kefir immediately, I put them in a little jam jar with just enough milk to cover them. They keep in the fridge for months this way. This is also what I do when traveling with my kefir. Since we probably use a gallon of cultured dairy each week, I choose kefir over yogurt because it’s faster and easier to make. The primary use is in our breakfast smoothies–I like the flavor and consistency of kefir smoothies even better than yogurt. The other main thing I use it in is soaking my baked goods. My tortilla dough*, pizza dough*, bread dough*, pancake batter*, and favorite muffin recipes* all call for yogurt or kefir, and I primarily use kefir because it’s a little runnier and so it pours into a recipe easier. Some people drink kefir–I’m not a fan, it’s just a little to tart for me to drink plain. But we still manage to consume several cups a day. This morning’s blender pancakes* included kefir and kefir will be key component to the peanut butter chocolate smoothie I’m craving for this afternoon’s snack. I think it’s safe to say my kitchen literally runs on kefir. *all these recipes can be found in my first cookbook! 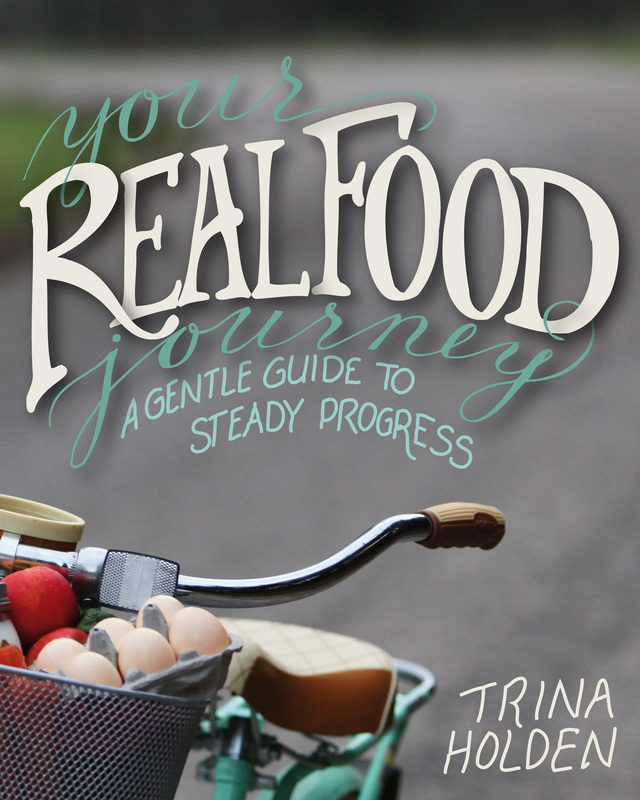 Want to learn another fantastic, fermented treat you can make in your own kitchen? Why not try Kombucha? And, yes, I teach people to make kombucha, too–with videos of each step and amazing flavor formulas. My new ecourse, Kombucha Made Easy, walks you through step by step–doors open February 13-18, 2017–get in now! I just received my first batch of kefir grains and have made several batches already. It is so easy. I used the packet variety before but this is much better. I make it in my yoghurt maker (basically just an incubator) and it makes over night. The flavor is fantastic, I actually like to just drink it but I also use it in my smoothies and cooking. Thanks for this advice, my grains are multiplying beautifully. I made my first home made today using your recipe. It turned out very nice. I won’t be trying the kefir though. Thanks for sharing your easy today recipe. You’re welcome, Annetta! Happy New Year to you! We prefer Waterkefir. Generally speaking waterkefir is slightly less concentrated than milkkefir and therefore some individuals find they consume more waterkefir than they would milkkefir. This is so encouraging! I do have raw milk available to me, albeit it’s 1/2 hour away and runs $10 a gallon…and not grass fed as we live in the desert near Phoenix, AZ. I may be able to find grass fed if I drove 2-3 hours, but that is just not feasible for me. Single mom and all. I know I remember seeing kefir grains on craigslist! Thanks for the reminder. So looking forward to really cleaning up our diet..I need to get healthy again!!! Struggling with residual issues from a seizure nearly a year ago with no answers as to why I had one, and the depression and fear that comes from worrying about another one. Also dealing with new allergies and memory issues due to hormonal imbalances (diagnosed with hypothyroidism a few weeks after my seizure but they say the two aren’t related). Sorry to have gone on so long, but I really am drawn to your blog. Thank you for all the information you have provided and the research opportunities you have shared! Karen, I’m so excited for the steps you are taking! I know from experience that even small changes can make a huge difference. Hope you find kefir grains soon! I have just a few weeks ago come accross remineralizing our teeth after with a bad dental experience. I never thought it could be done. Anyway I have never heard of kefir and would like to start making it so we can get proper nutrients in our diet. I live in nyc. How much would it cost for u to share some kefir grains with me. Ooooops!! I put my kefir grains in goats milk yesterday and snapped the kilner-jar lid shut! Viola! Then I gets an email from the friend who gave them to me who she had never thought of putting them in milk!! Apparently the method she relayed to my fella, who told me apparently and I forgot… was to add water, sugar and dried fruit?? Are there different types of kefir grains for water and milk based recipes? I did wonder why they were brown and not the little white bits of cauliflower like yours. lol. I have stained them anyway and now they ARE white. I am a huge experimentalist in the kitchen so put half back in the milk. The rest are waiting for a different recipe as soon as I know if I haven’t buggered them up, lol. Any input would be greatly appreciated. I have been making kefir for quite some time. I buy a quart of pasture raised plain organic kefir maybe once a month. I put about 1/3 of it into a container and then fill it up with coconut water. I put another 1/3 into another container and fill it up with unsweetened soy milk. I use the rest with pasture raised milk. The only one that produces grains is the one with milk. I never strain the grains, but just drink/eat them. Is this a problem? My son’s method is to fill a quart jar with 1/3 kefir and then the rest of the way with milk. He rubber bands a paper towel over the top and leaves it on the counter. He drinks a cup every day and just tops up the jar with more milk. I started trying that and it works like a charm. I skipped a couple days of drinking due to the flu and the kefir was bulging over the top. I put a canning lid on it and put it in the fridge overnight. This morning I was feeling well enough to drink it. I shook it up and should not have been surprised when it overflowed when I opened it. While I was drinking my cup and chewing huge grains, I decided I should ask you about eating them. 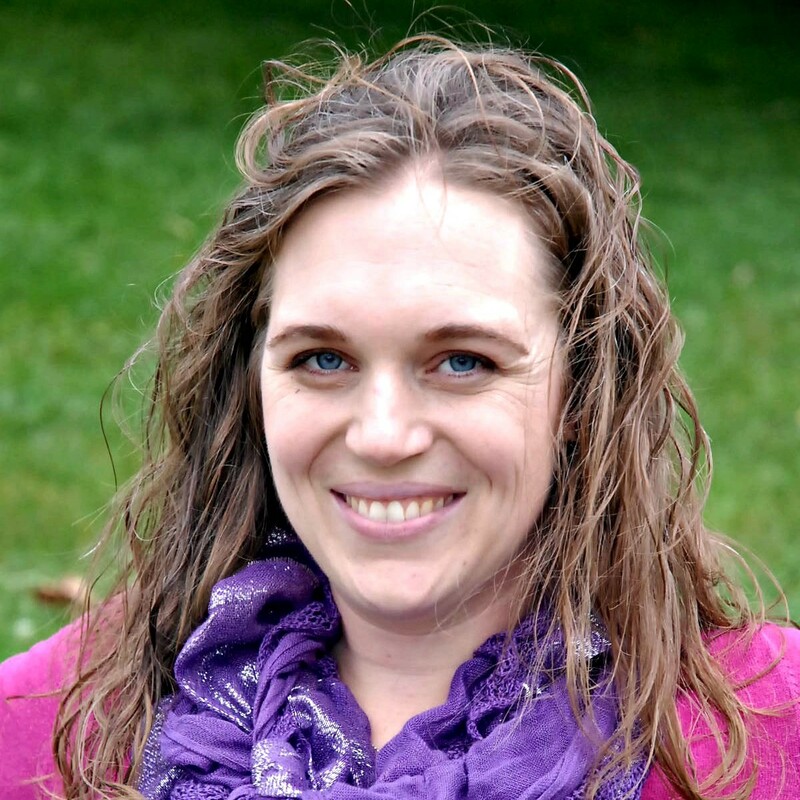 Emily, I’m amazed at your account of growing kefir grains from store bought kefir! I didn’t know you could do that! Yes, if you were to save the grains, I expect you could start a fresh batch with them and no longer have to buy the kefir. Thanks for your input! Kefir question for you, how does one know when it has firmed up? If we eat it to soon or let it sit for to long what would be the consequence? How long is the Kefir good in the fridge, as long as the date on the milk? Teena, lovely to meet you! 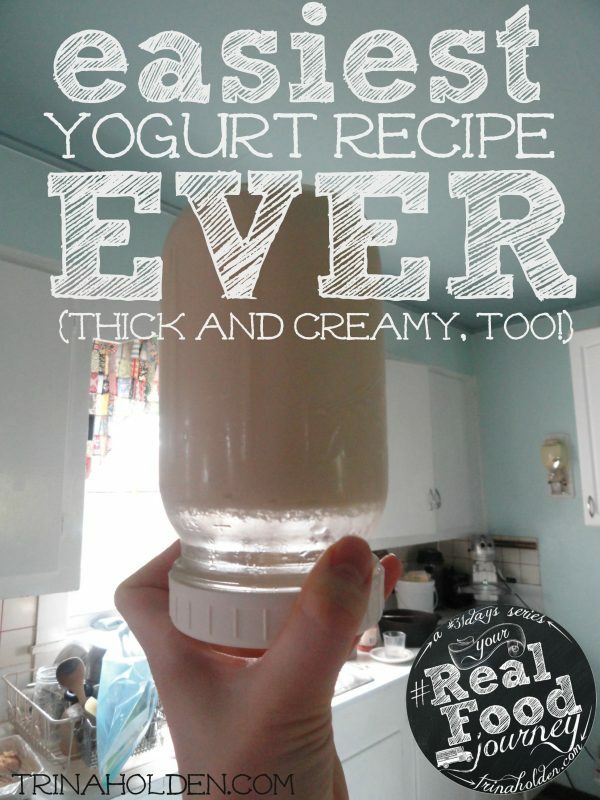 Kefir should resemble thin yogurt when it’s finished. It won’t be liquid, like milk, but more like a runny yogurt. It may even get as thick as yogurt, depending on your culture, milk, and temperature in your house. This can take anywhere from 24 hours to 3 days. You can tell when it’s bad–it smells really, really yeasty and yucky, and may begin to mold. Normally, kefir has a slightly yeasty, tart flavor, quite similar to yogurt. I just ordered my kefir grains. Thank you for teaching me so much, trina darling. Hooray! It’s been a pleasure, lady! Hello! Can the be flavored with puréed fruit? 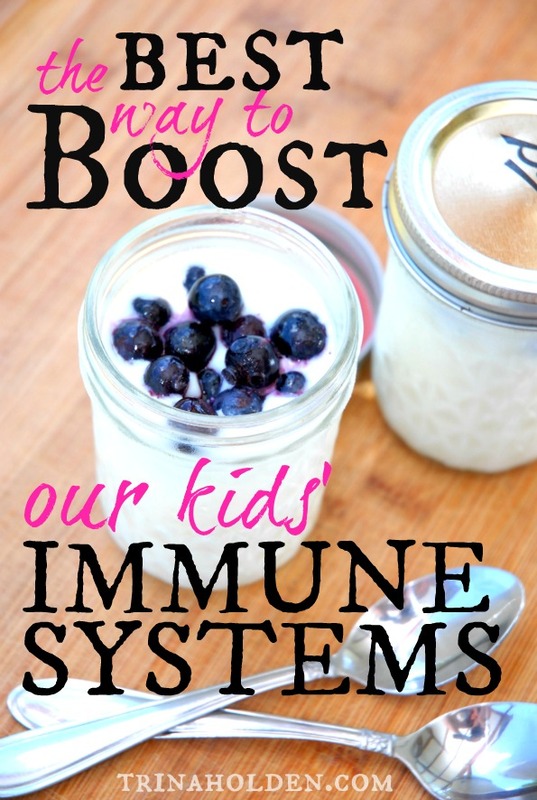 My kids LOVE the flavored kefir in the store… But it’s so expensive! Would you flavor it per glass as needed or can you store it flavored after straining? 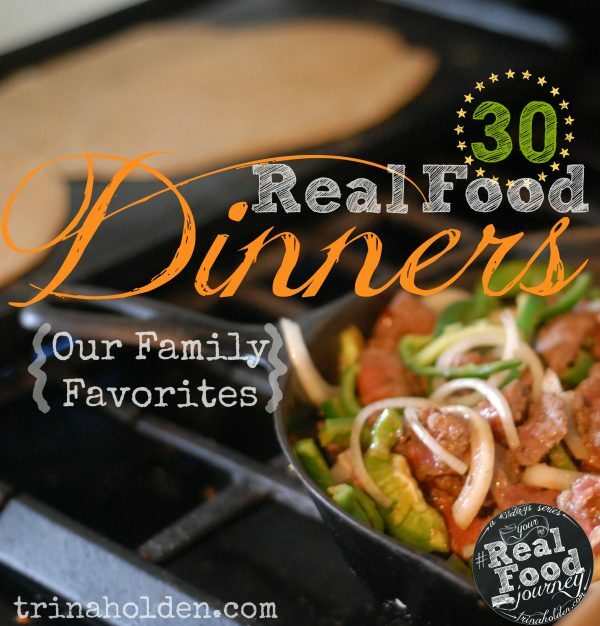 Love your site and cookbook! THANK YOU and many blessings! Glad you like the book, and so delighted to have you here! I like to blend it up with some banana and frozen cherries (sometimes the banana is frozen too) in my Nutribullet. At first I added a little honey to sweeten it but quickly found that was too sweet for me. I find the banana sweetens it more than enough and of course depending on the other fruit I use banana isn’t always necessary either. Blueberries, strawberries, mango, the options are endless and very kid friendly! Both strain and amount of grains as well as room temperature, season and I hear altitude can vary the time it takes for a batch to finish too in my experience. Some people like a tartar, sharper flavor than I do and you can control that a bit by sticking it in the fridge when it thickens just enough to fall away from the sides of the jar when you turn it and or start to form little pockets along the edge or bottom of the jar. To give it a stronger flavor you can wait until it separates and of course you can strain or refrigerate any time in between (refrigerating doesn’t stop the process but it slows it way down and I find mellows the flavor a bit and thickens the texture more). I say all of this because I think kids would like a more mellow taste, the stronger flavor still comes through with fruit blended in. I’m on the East Coast and in the summer my batch can be ready in 8-12 hrs while in the winter it’s closer to 24 using 1 teaspoon of grains, in winter a little more but again that depends on the grains, some strains take 2 Tablespoons and still others use far more the way others have described here. Make sure you find out what milk to grains ratio the person you get them from is using and start from there figuring out what gives you the kefir you like best and what works for you. I got my grains from someone in a sharing group on Facebook and I have learned a lot from the people there as well who are very happy to share both experience and grains and this is what I have learned from reading and personal experience anyway. It was the picture of Trina on the top of this site making either water kefir or kombucha with YL oils on a rack in the background that really caught my eye after the kitchen tips led me here but stumbling on this kefir recommendation with the fantastic simple make your own yogurt (who knew, I will even give it a try now!) direction’s, sold me! Time to get and read both books because I have learned something from everything I’ve read so far and it’s all right up my ally! 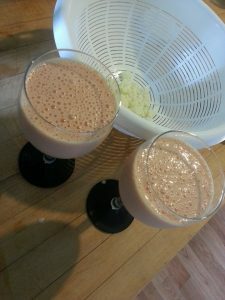 Thanks Trina and good luck Denise, I know with a little trial and error (maybe) you will find easy smoothie blends your kids will demand regularly! If you haven’t already. I’m so getting them sentbover when my sis-in-law goes to the States in November! I noticed it is sprinkled all througj your cookbook but had no clue what it was and necer actually got to searching that out. Sounds easy and good and it sounds great that you can use it in so many different ways! A question thay is not related to this. My sister is expecting and doesn’t drink raw milk because she heard that that is dangerous. What are your thoughts on that? I find so much conflicting information! Personally, as I’m sure you’ve figured out, I drink copious amounts of raw milk, pregnant or not. 😉 My milk comes from a farmer I trust who keeps his milk room clean, the milk is refrigerated almost instantly, so there is very little chance for bad bacteria to get the upper hand.